This retailer is thinking big as in tripling their store count. Five Below currently has 750 stores. Sales in 2019 rose 22% compared to 3.7% for Target. Five Below, Inc. operates as a specialty value retailer in the United States. It offers accessories, including novelty socks, sunglasses, jewelry, scarves, gloves, hair accessories, athletic tops and bottoms, and T-shirts, as well as nail polishes, lip glosses, fragrances, and branded cosmetics; and items used to complete and personalize living space, including glitter lamps, posters, frames, fleece blankets, plush items, pillows, candles, incense, lighting, novelty decor, and related items, as well as provides storage options for the customers room. The company also provides sport balls; team sports merchandise and fitness accessories, such as hand weights, jump ropes, and gym balls; games, including name brand board games, puzzles, collectibles, and toys covering remote control; and pool, beach, and outdoor toys, games, and accessories. In addition, it offers accessories, such as cases, chargers, headphones, and other related items for cell phones, tablets, audio, and computers; books, video games, and DVDs; craft activity kits; arts and crafts supplies that consist of crayons, markers, and stickers; and trend-right items for school comprising backpacks, fashion notebooks and journals, novelty pens and pencils, locker accessories, and everyday name brand items. Further, the company provides party goods, decorations, gag gifts, and greeting cards, as well as every day and special occasion merchandise products; assortment of classic and novelty candy bars, movie-size box candy, seasonal-related candy, and gum and snack food; chilled drinks through coolers; and seasonally-specific items used to celebrate and decorate for events. It primarily serves tween and teen customers. As of February 2, 2019, Five Below, Inc. operated 750 stores. The company was formerly known as Cheap Holdings, Inc. and changed its name to Five Below, Inc. in August 2002. Five Below, Inc. was founded in 2002 and is headquartered in Philadelphia, Pennsylvania. Company description from FinViz.com. Five Below has 750 stores and is targeting 2,500. Their rapid expansion is the key to their surging 22% rise in revenue. They are not planning on 2,500 in 2019 but that is their goal over the next several years. They opened 125 stores in 2018. Average store volume is $2 million. Same store sales on those open more than a year was +4.4%. This rapid expansion should keep investors attention. They are projecting 2019 revenue to rise 19.6%-20.9% to $1.865-$1.885 billion with a goal of 145-150 new stores. They are adding three new states and will be operational in 36 states plus DC by year-end. Their Q4 earnings of $1.59 beat estimates for $1.57. Revenue of $602.7 million narrowly beat estimates for $601.0 million. Shares spiked $10 after earnings but gave it all back before beginning the current rally. 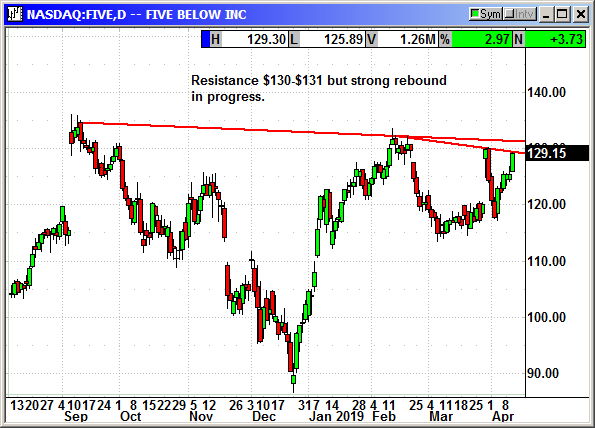 Shares are very close to a breakout over $130. Buy May $135 call, currently $2.50, stop loss $123.00.